I really like the first card. It's so pretty. And, I love the carolers. Great cards. Super cool holiday creations Kimberly! Love your use of color! Fabulous cards! The blue is such a fun color choice!! Holy fab-saucery! Not sure that's a word, but the black against the variegated background is just to die for! Awesome job! Great night scene card. I love those silhouette stamps. Pretty cards. Really like the Ornamental background card in blue. Gorgeous cards! Love the first one a lot! Loving this SOA collection and all of the amazing cards created. Great cards! I love the unexpected design and colors of the first one! Inspiration abounds with this vibrant collection of cards! Thanks so much for posting them! Finally someone used the cute squirrel...he was feeling very neglected! Your cards are beautiful, thank you for sharing with us! love these cards. The stencil is such a great background for the Christmas cards. And that background for the carolers--gorgeous! Lovely cards and awesome inspiration created. This SOA collection is amazing this season. There's so much versatility in this box of goodness. but the carolers is my favorite. Both of your cards are so cute!! Love your creative use of the tag dies on the first card and the pinks and purples make a wonderful background for the carolers. I love how you used the frame die on your first card! Great idea. Beautiful cards. Beautiful cards! Love the background design on your first card... awesome stamp! And pretty scene with the carolers! Cute cards! I love your use of the shades of blue on the first card. Very creative! Love that blended sky, shaded so subtly into the snowy foreground, for your caroler card. 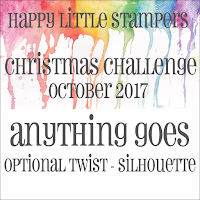 And I knew you'd come up with something funky--in this case, the off-kilter good-stuff tag die at an angle, as your sentiment panel. Enjoying you use of colors. Thank you for sharing your beautiful cards. Great night sky with the carolers!! This is a beautiful card - thanks for sharing! Love that blended sky! Gorgeous! Really fun cards! Loved your colors - blue is a great choice! I also liked how you used the partial frame! Thanks for sharing! Wonderful cards! Love the tree decorating scene. Great cards Kimberly! 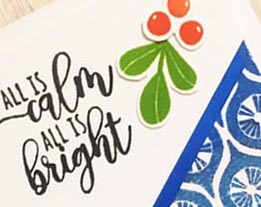 I so love that ornamental background die, I love the design of your card using that one! thanks for all the inspiration! Love the OhHoly Night one best! But they're all gorgeous. I think I'll have to case these! Thanks for sharing your awesome creations! I am itching to create now! Great cards! Wonderful take on the stamp sets, TFS! I love these, especially the second one. More great cards! Love the background on the second card with the carolers! I love these cards, can't wait for the release! Your first card's design has a lot of visual appeal - a bit different and quite lovely! 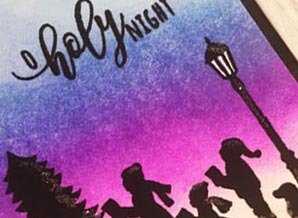 The second card with the carolers against a colorful night sky is very nice. Thanks for sharing! Thank you so much for sharing! This collection is going to be so much fun! Gorgeous cards! The caroler card is absolutely adorable! Love your night sky card! Great cards, Kimberly. I love how you arranged the carolers on the card. Great cards. So many fabulous ideas this weekend. Can't wait to get this collection. The background Stamp is going to be one of my very favorite. Your Carolers card is gorgeous. These are two great holidays cards ! Love the colors and creativity you used on these cards. They are fantastic. Kimberly, that last card really caught my attention, the sky colors are incredible! Such pretty cards. I love the colors used. Thank you for sharing. Everyones cards are so different yet so beautiful. blue, such an unusual choice! Love your color choices...so pretty! Beautiful pair of cards. TFS. Very pretty cards, I really like the creative use of the dies on the 1st card. I really like your silohuette card!! It looks so fun to play with. Such great use of that background stamp. I'm starting to get really excited! The colors used for the caroler card are beautiful. They give such a magical touch! I'm in awe of these designs!!! Your nighttime background with the sweet carolers is lovely. I'm totally loving the colors you've used!!! Super pretty cards! Stunning cards! I love the asymmetrical look and cut of the first card! Beautiful cards. Thank you for your inspiration. Beautiful cards and the night time sky is gorgeous. Awesome use of the tag! And the Holy night card is beautiful! Love the blue background stamp! Beautiful! Thank you for sharing your talents! Very nice effects with ink, the effects are great. A couple of great cards! Love that background can't wait to play with it! The carolers are wonderful and I love the sky you created! Thanks for sharing your creativity and talent! Pretty cards. Love the backgrounds. am enjoying seeing all the different projects...lovely work! What a lovely color combo on the blending! Very pretty cards and looks like a great kit!!!!! Love the glowing night sky ... lovely cards. Oh how I love the last one with the ink blended background and the carolers! You guys have done amazing work with that stamp set! It's what's going to make be buy the collection! Nice background for the carolers and the background stamp in blue is great! Lovely and inspiring cards. I love the blended sky in the second one - beautiful colors. Lovely cards. What a great idea to offset the corner of the die cut layer a bit. It adds an unexpected extra dimension. Thanks for sharing. Love the offset die cut on the ornamental background and the caroloers silhouette with the vibrant background is stunning too! Beautiful and festive cards Kimberly! TFS! Great cards, I especially love the second one with the carolers! So pretty. Thanks for sharing on this fun blog hop!! Your cards are awesome. I think those carolers are my favorite of the whole SOA box! That is such a beautifully blended background. LOVE your night sky on your Carolers card, it is gorgeous, and so much fun. Great job. You are totally rockin' the unconventional colors! That night sky...wow! Love your ombre sky with the kids singing. Your cards a beautiful, love the colors and how you used the die-sets amazing. Thank you so much for sharing your wonderful creations. I really love your caroler card. The evening sky really pulls it all together. I can't wait to get those carolers. Good job! The Carolers are lovely. I love how they are all shadow. That background stamp is wonderful in blue! I like the blue background you created. Like the way you did the carolers and coloring of the card. So different and bold. I like the Oh Holy Night best. Colorful sky with the silhouetted carolers. Beautiful cards Kim! I love how you used the tag dies on the first card. So cool! Love that you even got the squirrel in with the carolers!!!! Great cards! I love the cards. The night sky is gorgeous! That little pup with the carollers has my heart! A wonderful collection and great cards. I like how you used the tag die. Love your cards, especially your carolers! Great card and great Carolers, too! Nice card, hope I can make one like it. These are so awesome! Beautiful work! Love the carolers. So cute! Thanks for sharing. Both cards are gorgeous. Beautiful inspiration! Thanks for sharing! Love your cards! Thanks for sharing them with us. Love the little children carolers. I may have to case this card. Love the carolers card, I think they are my favorite in the sneak peaks. Love h0w you used the collection! Beautiful cards & designs! Great inspiration! Absolutely stunning cards! the use of the background stamp and then the layer on top with the sentiment is such a brilliant idea. Thank you for the inspiration! 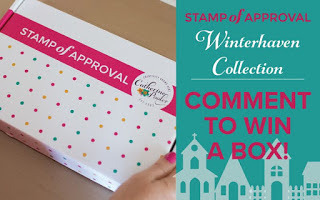 this stamp of approval box is so amazing! Ooooooh, I would love to win this box!! Love your Christmas cards! 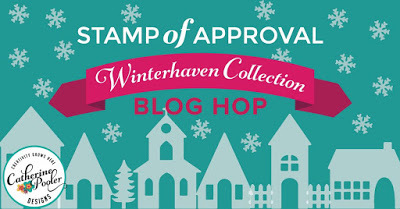 I am just amazed by all the beauty in this blog hop. I love the colors you used for O Holy Night. Love, love, love! Love the unique design on the first card & the gorgeous colors behind the silhouettes. Beautiful cards!! Love the coloring on your silhouette card. Makes me feel like I want to take a nice long stroll and go caroling. Beautiful colors on both cards. Cannot wait to play with these wonderful products. So many possibilities. Love how you've used the tag in a different way on your first card. Love your cards. They are so colorful and bright. Give me a happy feeling. Love the cards! Love the kit! Love these new products. Beautiful! Beautiful cards! 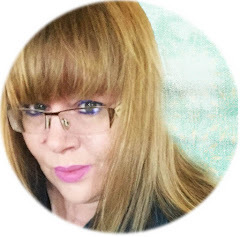 Loving the inspiration in this blog hop. I like the blue it's different and turned out awesome. Amazing!! So fun and creative!! Please just skip the word verification glitch, and click post, will work I promise!!! Thanks for coming by!!! Love your cards especially the O Holy Night one! Beautiful. Love your beautiful shading for your silhouette card; so pretty. What a holy sky on your silhouette kiddies card!